Answer: Shellfish, especially Oysters, need a hard scaly bottom in order to spawn, to grow, and to live successfully. Shellfish dredgers continually drag the bottom, which not only wipes out planlife and kills crabs and fish in their path, but they force sediment (decades of layers of bay bottom) up into the water column. This sediment, also called “silt” can stay in the water column for up to 24hrs until it eventually lands back on the bottom. Currents carry this silt sediment from where it was originally, and redistributes it all over the bay in a fine layer. This fine layer which is distributed daily, by six different ships, covers the rest of the bay bottom like a blanket. This “blanket” has turned the un-dredged bottom of Oyster Bay Harbor into a 12′ deep layer of loose mud. Loose mud is uninhabitable, it cannot sustain shellfish life, which is why the only Oysters found in Oyster Bay now have been planted artificially. Question: “The Oyster Bay commercial shellfish company says they plant millions of oysters every year. So how are there no Oysters in Oyster Bay? Answer: Oysters are born male, not male and female. Once they mature in size, and age, which happens after they have reached their most desireable stage in life for shellfish harvesting, about 80% turn female. It is not until this happens that oysters have the ability to spawn (to reproduce). So while Aquaculture (Aquafarming) does involve the planting, or seeding, of oysters in Oyster Bay Harbor, the commercially “seeded” oysters get harvested about a year before they grow mature enough to reproduce. So dredging has wiped out the natural oyster population in Oyster Bay Harbor, and Aquaculture has essentially neutered it. Answer: The Baymen create and maintain a system of floating “hatcheries” for baby clams and oysters to grow naturally, but protected from predators, in the waters of Oyster Bay Harbor. They purchase clam and oyster seeds, fill underwater drums which are supplied with constantly flowing water via electric pumps, and suspend them just under the surface of the water in a wooden framed device called a “Flupsy”. The seeds are watched over, moved as they grow into mesh bags, then eventually the juveniles are brought out into the harbor and sprinkled into the water in the hopes that they will grow naturally and one day spawn into “sets”. There was a time when Oyster Bay Harbor was teeming with oysters and clams as far as you could see. The beaches, the waters, both shallow and deep no matter where you looked. The Baymen hope that while those days are gone today, they won’t be gone tomorrow. So they have seed programs. Question: “Why are the Baymen suing the Town of Oyster Bay”? Answer: The town of Oyster Bay allows large scale commercial hydraulic shellfish dredging to occur, completely unregulated in Oyster Bay Harbor, regardless of the Baymen’s continuing pleas that this activity is currently harming the natural environment, and has been for decades. After years of countless unanswered requests for copies of legal documents which would prove Federal dredging regulations were being satisfied in Oyster Bay Harbor, the Baymen took matters into their own hands. They found that not only is the town’s neglect to provide such information a direct violation of the FOIA ‘Freedom Of Information Act‘, but that indeed none of the Federal dredging regulations had been, or are being satisfied. By Army Corps N.Y. district conditions, since 2012 “The limit of temporary or permanent discharges of dredged or fill material into wetlands and other waters of the U.S. must not exceed 1/4 acre;” The commercial hydraulic shellfish operation that the Town of Oyster Bay currently allows, and actually protects by use of taxpayers money, exceeds that 1/4 acre limitation by 1,799.75 acres… But this is just the tip of the iceberg. In reality, in order for a dredging operation of this scale to legally operate like it is today and has been since the 1950’s in Oyster Bay Harbor, a litany of Federal and State Department regulations and tests would have to be performed and satisfied. None of them are or have been satisfied in Oyster Bay Harbor. 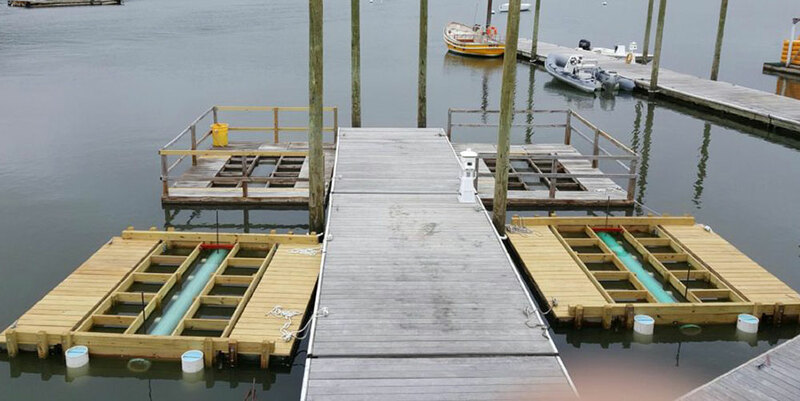 Dredging is illegal and the Town of Oyster Bay Harbor is allowing it.